After missing my “A” race due to injury, it has been difficult to find motivation for the remainder of my race season. 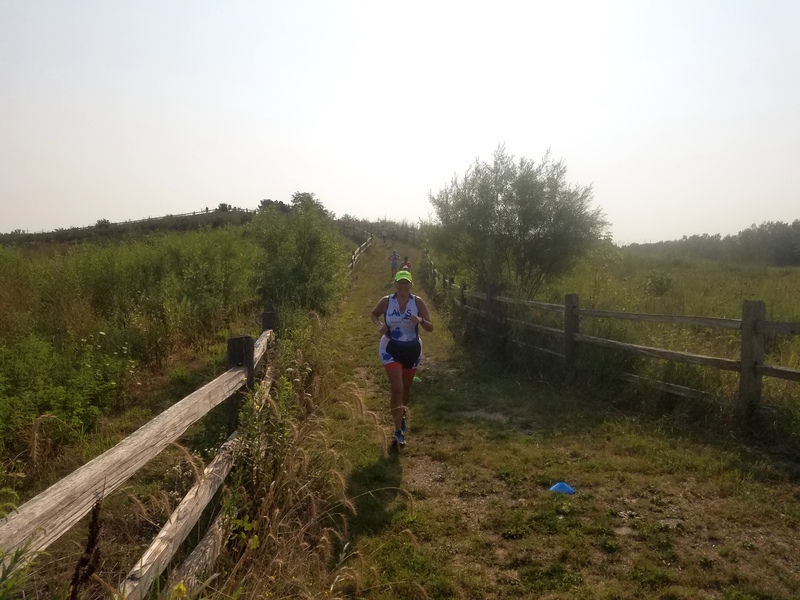 So, when a last minute opportunity arose to participate in the 2nd annual Crystal Lake Aquathon at the Three Oaks Recreation Area, I literally swam and ran at the chance! 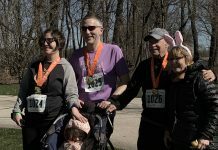 This event is the only true Aquathon in Illinois offering a Sprint (500-meter swim and 5-kilometer run), Olympic (1,500-meter swim and 10-kilometer run) or 2-mile swim only option. When I arrived at 6:15 a.m. for packet pickup, there were already a number of athletes milling about anticipating a fabulous race. Transition was prepared with flags and plastic bags corresponding to the participants bib number. Volunteers would be packing gear and transporting the bags to the finish line once athletes were on the run course. As I scouted the swim, I knew this race was special. About 50 yards from shore was an inflatable unicorn, a swan marked turn around for the Sprint and off in the distance were a couple of ducks on the long course. This was a great reminder that sport should have an element of fun! After a steel drum rendition of the Star Spangled Banner, the Olympic athletes were first in the water, followed by the sprint participants and then the 2 milers! Something about a mass start always makes me go out too strong; but, I eventually found a rhythm, made the turn around the swan and found my way up the beach, through the foot cleaning “kiddie” pools and into transition. Once on the run, I found the course to be unique. It included crushed gravel, cross country trails and even a few hundred feet of sand. Typically, I prefer pavement; but, I enjoyed this challenge immensely. Some unexpected features included a bridge where you ran alongside swimmers still in the water, a section of “switchbacks” and a monster of a sled hill! This incline took some athletes by surprise and people either loved or hated that segment of the course. The Olympic distance encountered each of these aspects again during their second loop. 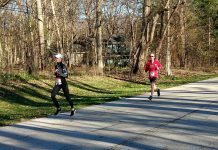 The finish celebration took place at Cable Quarry Park and included an amazing brunch and an option to partake in a much needed massage. Proceeds from the event (including a raffle and 50/50 fundraiser) benefited the Girls on the Run program. While there were many generous sponsors, Crystal Lake Brewing provided some very unique trophies for the top three finishers in each age group at all three distances. The Crystal Lake Aquathon definitely fills a void left by the city’s bygone triathlon which was cancelled some years ago due to logistical issues. But, according to Race Director Denise Smith, the city has been extremely supportive of this new and growing event which offers a unique venue, incredible views, interesting challenges and a wealth of fantastic volunteers!